The signed first edition of the James Bond's third adventure brought $50,000 this week -- says Paul Fraser Collectibles. James Bond first editions add excitement to any rare book auction, and Swann Auction Galleries' 314 lot auction on Thursday, April 8 was no exception, boasting 28 books and manuscripts penned by Ian Fleming. In particular, two first editions in excellent condition brought some keen bidding from the audience. The first was a beautifully preserved copy of Casino Royale, Fleming's first Bond novel. The black cloth of the cover itself is stamped with red heart in the centre and red lettering appears along the spine. The dust jacket is more familiar, however, with the bleeding hearts design created by Fleming himself. In this case it appears in all its glory, with only the faintest toning present, no doubt preserved by the burgundy morocco and cloth clamshell box which comes with it. The lot beat its top estimate of $30,000 to sell for $33,600. 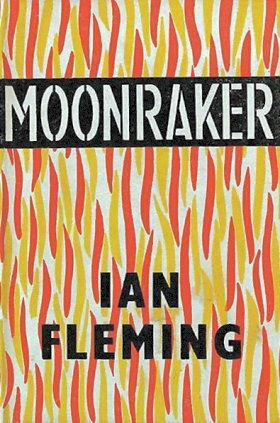 It was outstripped, however, by a signed copy of Moonraker, Fleming's third novel. The black cloth covers, stamped in silver and clothed in its dustcover with the well known 'firey' design, the copy is also in exemplary condition. Inside, Fleming has written "To Eileen M. Cond Who cannot be easily shocked! from Ian Fleming - 1955.". This caused frenetic bidding from the audience, and the upper estimate of $25,000 was doubled before the winning bidder took home their prize for $50,400.